Asphalt shingles vs wood shakes roof – comparison chart. 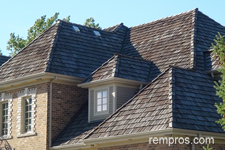 Which roofing material is better? 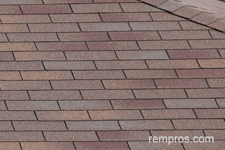 Asphalt shingles available in variety of colors from light grey to dark brown. It is a good fit to any house exterior design. Natural look of real wood. Most manufacturers recommend installation of 3-tab asphalt shingles on the roofs with 2:12 or greater pitch, but some products should be installed on the roofs with minimum 4:12 pitch. Local building codes might restrict installation of low resistant to wind, of physical damages shingles in certain areas. Majority of cedar shakes designed for installation on the sloped roofs with 4:12 minimum pitch. Installation of wood shakes might be prohibited in certain areas due to high fire hazard. Depends on product, normally withstand 60 – 70 mph wind. Vary and greatly depends on installation quality. Most wood shakes can easily withstand over 110 mph wind. Good resistance to impact and withstand hail storms much better compare to asphalt shingles. Very susceptible to open fires. Low resistance to moss accumulation. Subject to weathering, but properly installed and treated wood shakes is a durable roofing material. Good ability to withstand feet impacts, but walking on a roof should be done with exceptional care and only in case of roof inspection, maintenance or repair. Fair ability to withstand feet impacts. Older wood shakes can be easily broken under the feet. Quality asphalt shingles last about 15 - 20 years. Greatly vary and depends on a region, weather condition, and maintenance. Normally lifespan of cedar shakes is 25 - 35 years. Maintenance typically includes cleaning of any debris from shingles. High maintenance roofing material. Without proper care wood will rot and can be easily damaged by weather condition quickly. Vary, normally manufactures offer 25-years limited warranty on asphalt shingles. Bundles approximately 13 in. wide and 40” long. 1.9 – 2.1 lb/ ft2. Depends on wood thickness, species and exposure. Kiln-dried cedar shakes considered as a lightweight roofing material. One of the cheapest roofing materials. Greatly vary, but normally more expensive compare to asphalt shingles. Charges to install one square of asphalt shingles are lowest compare to any other roofing materials. Labor fees for wood shakes installation could be 40% – 60% higher in comparison with asphalt shingles. Installation of traditional shingles is one of the easiest tasks. It is much harder to install cedar shakes than asphalt shingles. Not recommended for do it yourself installation roofing material. Installation of 30 squares of asphalt shingles on low or medium slope roof normally should be completed by a crew of six in one day. Replacement of same size roof typically takes couple days. Crew of 7 normally is able to install 35 squares of wood shakes on simple gable roof with 6/12 pitch in 3 to 5 days. Replacement might take 4 to 7 days. Depends on damage. It could be a hard task to repair wood shakes on a roof. A few layers (often 3 - 6) – depending on local codes and roof condition. A single layer of wood shakes can be installed on adequately built roof structure. Blowing off shingles by strong wind, physical damage, moss accumulation, leaking in valleys. Poor installed flashing, rotten wood, splits, gaps in between shakes. 1 Rating was estimated on the scale from 1 to 5, accounting 1 as lowest and 5 as the highest quality of a product. Always consider the fact: not all products made equally the same and performance of particular roofing material significantly depends on individual product quality, adequate installation, and proper maintenance. Asphalt shingles and wood shakes have their own advantages and disadvantages. There is no straight answer which roof is better. With adequate installation and proper maintenance a quality wood shakes roof have longer lifespan compare to budget friendly asphalt shingles which still tends to be much more popular roofing material.